THE number crunching can prove a pleasant pastime for Hibs’ full-back David Gray right now. On Friday night the 26-year-old featured as the Leith club racked up a third consecutive league victory in one season over Rangers for the first time in their history. The 2-0 victory at Ibrox means they have now netted nine and conceded only one in three Championship wins over their promotion rivals. The nine points accrued from these matches for Alan Stubbs’ men has allowed them to move past Rangers and into second place, albeit having played three games more than the Ibrox side. On a personal note, meanwhile, Gray’s recent comeback from a groin operation that sidelined him for almost the whole of January leaves the summer signing only three outings short of a best-ever games total for a campaign. 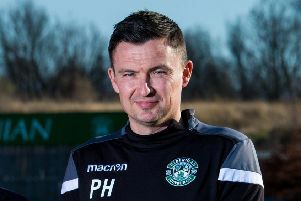 The move to Hibs put an eighth club on the player’s CV in a career that began with Hearts, took him to Manchester United and then Plymouth via various loan spells, but in recent seasons has found him in the lower reaches of the senior English game with Stevenage and Burton Albion. Yet, there is only one set of figures from which the defender believes real meaning might be divined. Since late September, Hibs have played 22 games. Inside 90 minutes, they have only suffered defeat in one of them. “We can take that onto the next part of the season and see how far we can go,” says Gray. “But we know we have let a few games go where we should have picked up the three points. At the start of our run there were a lot of draws, particularly at home. That has knocked us back a bit, we would be a lot nearer the top if we had turned those draws into wins. The hold Hibs have over Rangers appears to have the potential to give them a psychological edge should the pair, as expected, meet in the promotion play-offs when the dust has settled on the regular Championship season. “I think we are confident going into every game in this league. If we play well, play to our potential, then we are a match for everybody,” he says. Even if they are second tier, the growing sense of a club on the up that surrounds Stubbs’ side is looked upon as vindication by Gray of his decision to pitch up at a demoted side that was in utter disarray going into the close season.